We supply a wide range of hydrocarbon soluble dyes and markers for use in fuel systems. These additives impart distinctive colors to gasoline, middle distillates and other petroleum products, facilitating fuel identification for both fiscal and security purposes. Nova provides a broad selection of color shades to meet most needs. Customers can also request a custom shade. All our liquid dyes can be easily metered into pipelines and terminals for automated dosing of dyes. Typical dosing rate is around 10ppm for fuel identification purposes. Small quantities of dye can be added into the bulk fuel container such as a terminal storage stank or fuel tanker. The dye should be poured into the tank near the fuel inlet or into a fuel transfer hose such that once fuel flow beings the dye will be dispersed by the flow into the bulk of the tank. For larger bulk quantities we suggest using dosing systems. 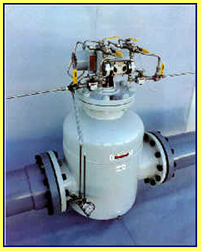 For fuel terminal and refinery applications Nova provides the CJ150 continuous inline injector. This device is installed inline with a fuel transfer line. The fuel flow powers a dosing mechanism to inject dye at a precise rate.